A large forest tree, to 100 feet tall and a trunk to 3 feet in diameter, with a tall trunk and a relatively short, oval crown. Throughout East Texas, westward to the valley of the Trinity river. It grows best on the rich, moist, well-drained soils and slopes adjacent to riverbottoms. Opposite, compound, 8" to 12" long, with 7 to 9 (usually 7) leaflets arranged pinnately; leaflets are 3" to 5" long, short-stalked, ovate or oval, pointed at the tip, margin smooth or with a few remote teeth. 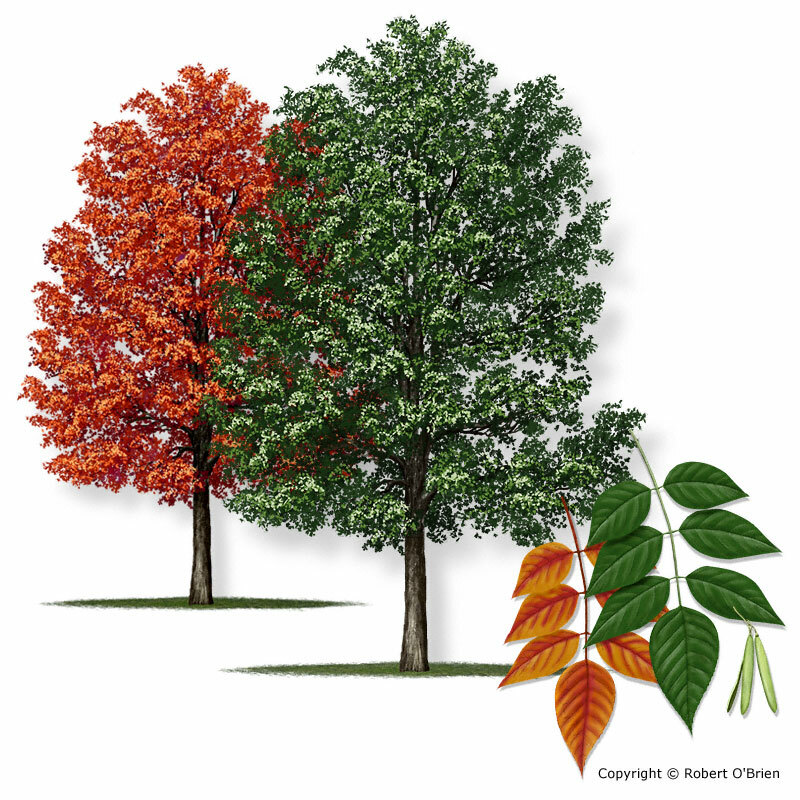 Leaf color is dark green above and whitish beneath, turning gold, orange, or purple in fall. New rust-colored winter buds sit tucked into a notch of the leaf scars left on the twigs after leaf drop. Male and female flowers appear on separate trees, the male in dense reddish-purple clusters and the female in more open branched clusters. A "samara," maturing in late summer and distributed by the wind, 1" to 2" long, resembling the blade of a canoe paddle, with the smooth, tapering seed at the handle end. The wing of the samara is often notched at the tip, and is attached rather abruptly to the seed. Gray or whitish, with interlocking flat-topped ridges and furrows that deepen and darken with age. An extremely valuable timber tree over its native range due to its toughness and elasticity. It is preferred for tool handles and baseball bats, and is used extensively for furniture and interior finish, such as cabinets. Green ash (Fraxinus pennsylvanica) has narrower leaflets with pale green undersides, buds that sit above the half-moon leaf scars, and seed wings that extend halfway down the seed. Texas ash (F. texensis) occurs in Central Texas. The ash genus includes several species named for a color, including white, green (or red), blue, and black ashes.